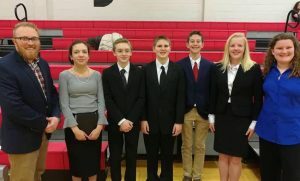 SCA Jr. High Speech & Debate Coach Caleb Westbrook, 7th grade student Charlotte Brownlee, 7th grade student Aidan O’Donnell, 7th grade student Isaac Truesdale 7th grade student Caleb Dawson 7th grade student Caroline Hammett, and 8th grade student Briana Chapman made an impressive first showing at Raytown South Middle School. 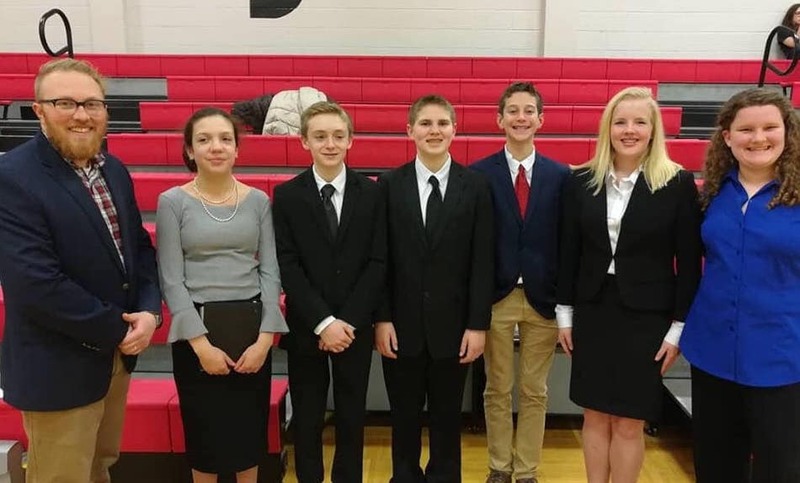 The Jr. High Speech and Debate team from Summit Christian Academy (SCA) recently competed at Raytown South Middle School. Debate team duo of Isaac Truesdale and Aidan O’Donnell won 6th place and duo Briana Chapman and Caleb Dawson won 7th in novice debate. Humorous Duo team Charlotte Brownlee and Caroline Hammett won 7th. Charlotte Brownlee took 3rd in Prose and Caziah Carey took 5th in Storytelling. “I couldn’t be more proud of these students’ spectacular first showing,” shared SCA Jr. High Speech and Debate Coach Caleb Westbrook.